Take a look back at old and more recent Early Learning Centre wooden farm sets from the last decade to two - though it isn't always possible to find the data we need. Well we've taken a look through all past models, will be sure to give you the opportunity to buy it now or find out more information. Early Learning Centre have released many farm sets over the years, relying on the self-assembly method - mass produced in MDF. And well they may have started with less vibrant colours or realistic design, the range has improved over the years. Take one of the first, the ELC Farmyard Play Set - or many variations of the model - which has very basic design, based on old 60's toy design. Back then it had very little colour and much of the MDF was unfinished. ELC produce far more attractive - and in many respects more educational - farm sets in MDF and are fully printed (as oppose to painted). At present, Early Learning Centre of now focused more on a series of plastic farm sets, which has forced us to update our list to include wooden and plastic playset's too. Though you will find the edges are painted for a far more impressive finish, representing farms how they look today with plenty of add-ons and accessories available. Right now, we mostly have here Early Learning Centre wooden farms (with a few plastic sets) from their humble beginnings up until early 2019. Status: active item - Buy it now before its no longer available. Available from ELC online or Mothercare, both of which supply the same stock. The recent addition to the ELC wooden farm set release spends more time out of stock then in, so we have a feeling this one will soon be discontinued. Which is a shame because visually, its an attractive looking toy farm that is sure to stir the interesting of any child. Well it all sit's on a big colourful base board that is pushed together to get setup out of the box, all the farm buildings are simply positioned in all the corners. There's opening doors, windows and removable roof panels for easy access. A working winch for lift things to the hayloft above the barn will draw a lot of interest to. As usual it will fit in with all Early Learning Centre farm toys; including there current figures and farm animals. This one of a few Early Learning Centre's foot in the door plastic farm sets. 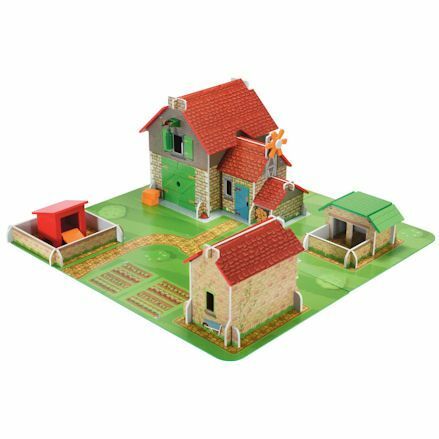 Previously they would be for children 3 years and up, but with this Happyland Farm Set its starts at 24 months, so there's a set for toddlers. And a childish looking farm set it is too; this one would be hard to sell over on a child of 3 years plus, but for a toddler, they design will sure attract them to it. Taking young ones into consideration in the design process, all the corners are rounded off so they're a little safer. This also means the farm animals, figures and accessories are all chunky so if there's chewing - there will be no choking. 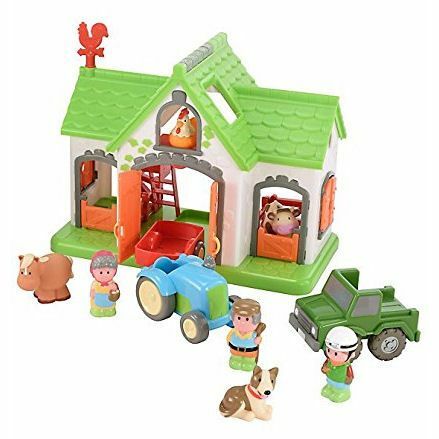 The Happyland Farm is the focus of the play, with a few farm animals and a pet dog, with farm figures used to look after the animals and drive one of two farm vehicles. Status: active item - Check with Mothercare for all current models. ELC's long list of toy farm design has always stuck to the same theme, which appeal to both boys and girls. But what better way to get girls interested more, than a specially made farm set for girls - finished in pink with light, playful colours. Where there's a pink toy farm requires matching accessories and add-ons. And so have ELC provided all this for you in the set with farm animals, farm people and a few panels of fencing. Highly girly playset that was focused more on girls, so a set like this in this day and age is highly unlikely, with genre specific toys disappearing from the shelves. Status: discontinued item - Still widely available to buy online brand new or search auction sites for when its up for sale. This model currently stands as the only farm set in the ELC range which is made from MDF, earlier models have since retired, so you need to dig deep to buy one. But for the ELC Brambledale Farm it follows up on an improved design from the much loved Cobblestone Farm. But in this updated farm, you get far more detail and bright colours offering just as many features., but as usual, self-assembly is required. These include five major farm buildings in total including; the main building in the barn, the stables, shed and coop. This all sits on a cardboard-like, laminated baseboard, which you can choose to position the buildings as recommended, or place them where they desire. Status: discontinued item - Still early days since its stopped being developed by ELC, so should be easy enough to find one online. The release of Cobblestone Farm was always going to let down parents. But well this model does show plenty of character, is just lacked colour and perhaps just a little to realistic. But as normal in the range it came with plenty of buildings with lots of features. The main building is the barn - or cow shed - with the big swinging doors, farmhouse, stable, animal and sheep pen and of course the chicken coop. This farm sat on a big square base with a track, pond and plenty of space to sit the buildings. Status: discontinued item - Look to the newer release of this earlier model for a better farm set. That's right, there was a ELC Happyland Farm released previously, though due to lack of interest it was a short lived toy. And so ELC came back with an improved offering four years later with the current offering with the 2016 version. A lot has changed to in regard to the overall look and feel, with this earlier release still a farm sets for toddlers - from age 2 and up. As usual, it was plastic so thereby is was quite durable, it also had a chunky feel but came with less accessories this time. Though to be fair, this Happyland Farm came with a set of fencing, with the current model missing this out. At this stage, the following farm sets are now moving onto one we would class as vintage, hard to find but its possible if you no where. Status: Discontinued item - search eBay or similar auction sites for when it becomes available. A wooden farm set with lots of character, but without the need of a fancy, friendly name. 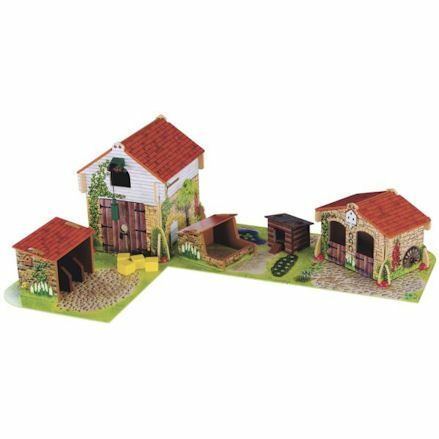 This ELC Western Farm Playset is very different from the range but really only a few things separates it. A few things you'll notice in this set are no baseboard, much bigger buildings and the whole set centred around a big red American style barn. So, with the barn features a swing opening door and a sliding door on the side, 2 stall stable, shed and set of 4 slot-together fencing panels. Status: Discontinued item - Most likely one of them all to become available regular on auction sites, so snap it up quick when it does. Minimal effect was put into this early release with both the design and name of the item lacking. But this doesn't deprive a very good farm set offering lots of activity, and is effective today then it was back then - and a cheaper item to buy. The slot-together method still was going strong then, but the unattractive colour of the MDF showed through on the surface and the unpainted edges - making a very dull toy farm. But well very effective, access inside the buildings can be accessed through the roofs thanks to a thick, green tape holding the roof panels together. The ELC Wooden Farm included three buildings used as a tractor shed, barn or animal pen, with a chicken coop and pig sty included. Status: Discontinued item - No longer will you be able to buy this set, its been too long and far lost. Product naming back then lacked imagination but as we know today, ELC began to give their farm sets friendly names like Cobblestone or Brambledale. But it might be a push calling this one a 'classic' farm playset because toy farms built in the 50's through to the 90's weren't made from MDF or had a slot-together design. But Early Learning Centre do have the right idea with the building design, because they did look like that in the olden days. Aimed at 3 to 6 years, this farm included five buildings in total, with two barns, stable, chicken coop and pig sty. Well the sty had no gate or the building entrances lacked doors, imaginative play would encourage young ones to use the fencing panels to stop the animals escaping and create pens. As with the designs back then, you could sit a couple of buildings on the base or positioned them around the base to allow more space on the board. Status: discontinued item - Forget about it, as you can imagine seeking out a farm set this far gone in the series would be hard for anyone. 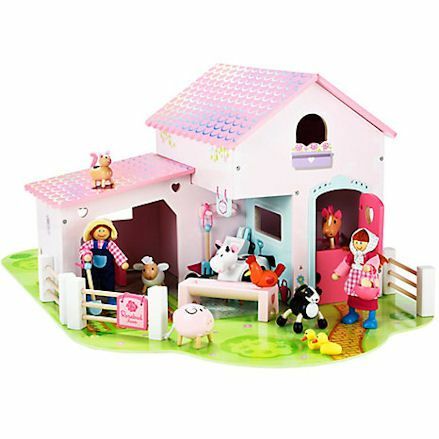 Last but not least is this early ELC Farmyard that represents a farm made with love. Firstly you'll notice this isn't the slot-together design we've become accustom to, but using wooden dowels that fit into the corresponding holes. And well still made in printed MDF, natural wood is featured like beech or maple to use in the fencing panels. 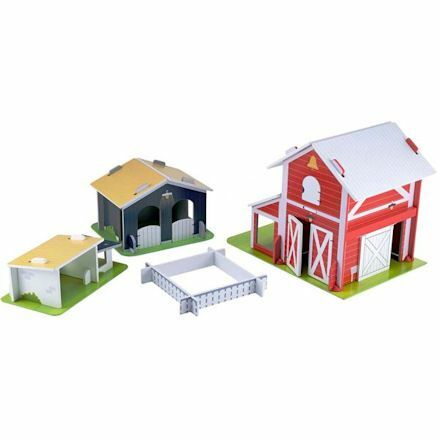 The set includes; a red barn with green roof, stable, cow shed, sty, coop and hutch with even a tree to complete the set. 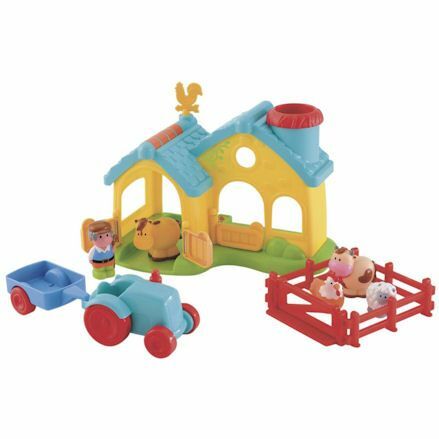 Well Early Learning Centre have produced more wooden farm sets than featured here, what we do know is that the releases continued on the early designs with variations in wooden, play, farm, and set making up the product title. 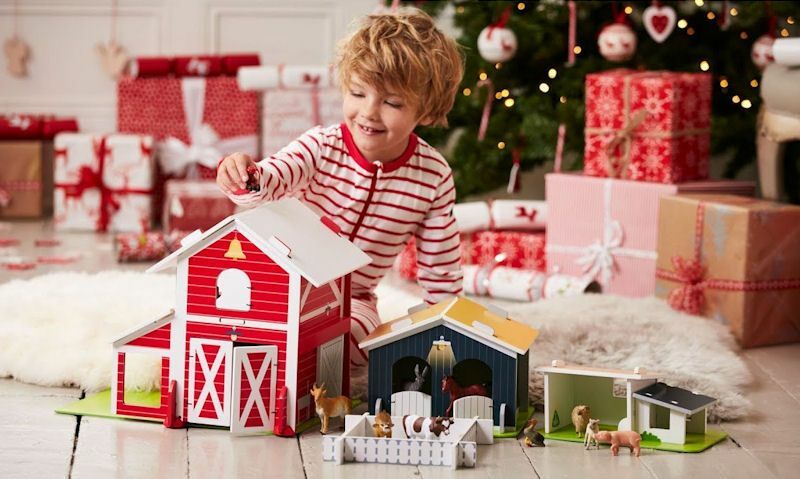 ELC wooden farm toy releases come and go very quickly, so you need to be secure to buy when before they're gone again, so waiting until Christmas won't be a good idea. Snap up ELC farm set from the past or present as soon as you get the opportunity, as it just may be your last chance.